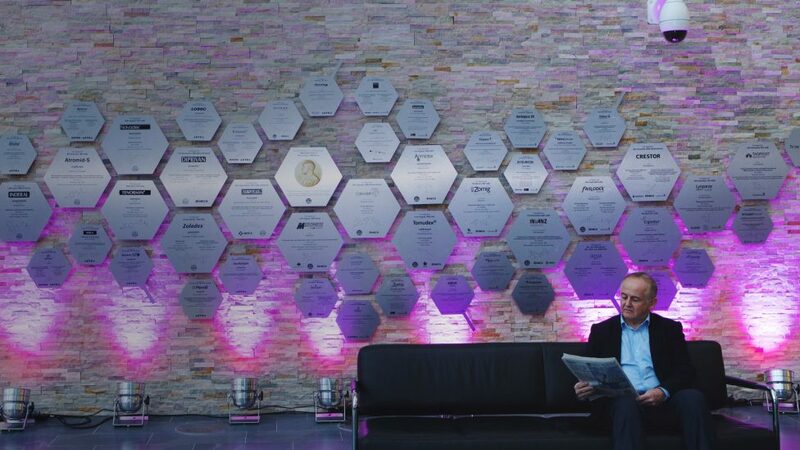 We developed a stunning corporate interior design idea to celebrate AstraZeneca’s research legacy and inspire future generations of scientists. With this corporate interior design project AstraZeneca wanted to celebrate its past achievements and inspire future generations of scientists. The design also had to help celebrate a major recent announcement in an unveiling ceremony, open to an exclusive guest list made up of renowned scientists past and present. Their latest drug against lung cancer had been approved for use in the US – a timely triumph and a very positive step toward our client’s ambitious goals fighting against disease. The interior design elements would also honour the scientific legacy AstraZeneca was leaving behind after moving most of their R&D operations from Cheshire to the growing Biotech and IT hub in Cambridge. The design would still make an impact on the scientific community in Cheshire as 700 AstraZeneca staff were remaining on the prestigious site, which would now be shared with an extended bioscience community. Having worked with AstraZeneca for over 20 years, they trusted us with a blank canvas – a wall in their flagship building reception. Strategically positioned, the design would be seen by the thousands of staff and visitors that walk through the area every year. We ensured the design had a prestigious feel, to match the message and intentions of our client’s commission. The wall was not solid. A cladded metal frame had to support the design, so we worked with Dibond, a very lightweight – yet rigid – material. This ensured the design was structurally sound without compromising the prestigious nature of what it helps commemorate. Inspired by the very essence of what AstraZeneca excels at, we turned a molecular chain into a timeline showcasing our client’s achievements in biology and pharmaceuticals. The timeline design culminates in the development of AZD9291, known commercially as Tagrisso, the drug that signals a new and exciting chapter for our client. “It would be good to have you at the reveal after all the hard work. The design gives prominence to breakthrough discoveries made at the Alderley Park site by slightly raising the larger cells. The striking corporate interior design, which will inspire scientific minds for years to come, has already made an impact. Scientists and visitors alike have been drawn to the piece that seamlessly integrates science and artful design.